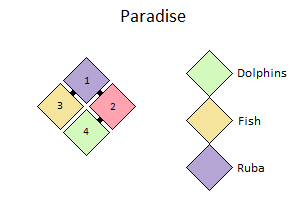 Talk to Ruba at Paradise 1 (61,22) and purchase an Island Fishing Rod and some Island Fishing Bait. Head South to Paradise 3, equip your Island Fishing Rod and rapidly click the fish to attempt to catch them. You may also catch useless boots. You can throw these away. Once you have a few fish head to Paradise 4 and give them to the dolphins. (Drag and drop onto them).